What is Animal Science? The Animal Science curriculum provides students with a foundation in biological and natural sciences, animal breeding and genetics, livestock production and management, reproductive physiology, livestock nutrition, and meat science. This curriculum emphasizes ecological principles to solve management problems. 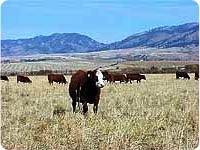 Coursework integrates knowledge of rangeland plant, soil, water, livestock and wildlife resources while cultivating critical thinking, problem-solving, and communication skills. Field experience is provided by using the surrounding environmental resources of the Gallatin Valley and Yellowstone National Park. A degree in these science fields prepares the individual for a career in a variety of settings. Below is an example of some of those career opportunities.